Testing of medical device pouches by a third-party accredited ISO/IEC 17025 medical device pouch testing laboratory is a great way to help you stay compliant. Please take a few moments to read our seal performance study SOP and disclaimer. 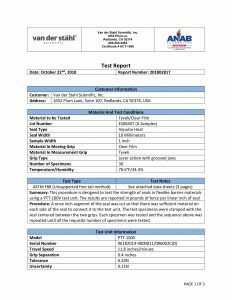 Our standard test program includes a 30 specimen seal strength test per our peel study SOP, as well as a 3 pouch dye penetration evaluation. It is important that you understand and agree with our test methodology and protocol to be sure that it meets your internal requirements as well as any 3rd party requirements before commissioning a study with our laboratory. 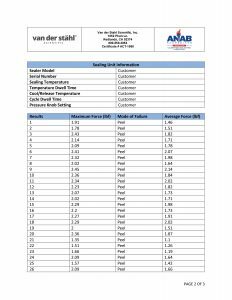 Van der Stahl Scientific does not interpret data as to the value of pouch seals as it relates to your medical device packaging validation. The scope of this study is to provide raw data for your interpretation. For additional questions contact our engineering group, 800-550-3854. Seal your pouch samples, or gather samples from production that you wish to have evaluated. 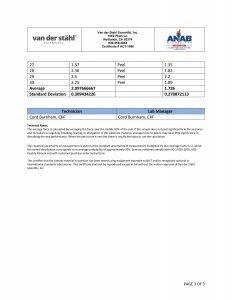 Be sure to note the sealing machines serial number that created the samples. If you require pouch normalization periods longer than our standard 48 hours, please indicate your normalization period preferences. Provide us with adequate seal samples (35 for our standard test program) as well as additional buffer samples. If you are sending samples sealed at various time and temperature settings please mark specimens individually to thwart confusion. Please indicate any special conditions on this form. Be sure to read our peel study SOP and disclaimer to be certain that our testing methodologies are in sync with your regulatory and internal requirements. Please fill out the form below and provide us with any additional comments in the comment field below. Send in sturdy box to our Laboratory. Ensure that the number of samples that you are sending is sufficient to perform the tests. Remember that some of the material may be sacrificed during the process of determining the upper and lower limits of the material. For every different type of material, or different size of pouch, an individual form must be filled out with the required information so that the test report can be completed properly. I have read and agree to the Medical Pouch Testing Request Terms.